Today we carried out lots of interesting activities. First we listened to a story about The Three Little Monsters and then discussed the issue of commentating positively and what to do if something worries or upsets us online. After this we looked at our 'Digital Footprint' and we found out that what we do on the internet can leave a trace and builds up a picture of our likes and interests. We made a 'Kindness Tree' and every time someone is kind to us we will take a blank leaf and write their name on it with a description of what they did. Then we will attach it to our tree. It is only day 2 and our tree is filling up fast because we are so kind to each other. 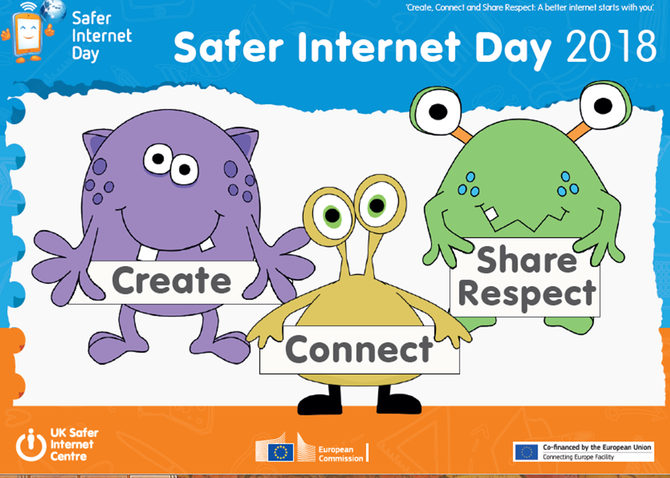 Finally we discussed the different things we do to keep safe in the sun, safe on the roads and also safe on the internet. We are creating a power point with a different slide for each group of animals. We talked about how to use safe searching and how to obtain copyright free images. Today the children went on a technology hunt-identifying examples of technology & its uses in different areas of the school. We discussed school rules on the use of technology in school. In DT we talked about using safe searching when on the internet and then used Google Safe Search to research Fire Engine design.